Doctrines outlined in the proclamation apply just as much today as they did in 1995 when the First Presidency and the Quorum of the Twelve Apostles issued the document. 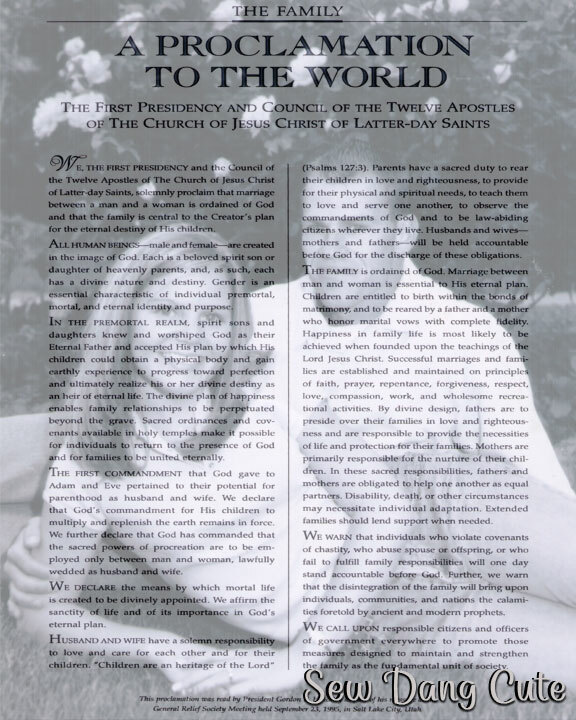 The Proclamation reflects the doctrine on the family as taught in The Church of Jesus Christ of Latter-day Saints. Elder M. Russell Ballard of the Quorum of the Twelve Apostles said the Proclamation is “a stern warning in a world where declining values and misplaced priorities threaten to destroy society by undermining its basic unit” (“What Matters Most Is What Lasts Longest,” Oct. 2005 general conference). As I have worked through each assignment this semester, focusing on the doctrines and teachings of this prophetic document, I have come to more fully appreciate the blessing of having a prophet upon the earth to warn and guide the children of God. The words in this document may offend some. To those who take these truths to be hard, I quote the Prophet Nephi, “And now my brethren, if ye were righteous and were willing to hearken to the truth, and give heed unto it, that ye might walk uprightly before God, then ye would not murmur because of the truth, and say: Thou speakest hard things against us (1 Nephi 16:3). It is difficult for some to hear truth. The adversary has worked tirelessly to replace truth with lies that he might lead the children of God to destruction. We live in a world where many want to live by their own ideas, rather than by the laws of God. It is my personal witness, that if an individual were to open their heart, and give this document careful consideration, the Spirit of truth will touch your heart and help you to gain your own witness of this prophetic document. UPDATE: 12/1/15 During my morning personal study, I reviewed this conference talk. Elder Martino was the visiting authority during a recent restructure of my local stake. He left my stake with a beautiful blessing and message during his visit. I was excited to hear him speak this past General Conference. I’m sharing his talk here, on this page, because the message in this address on finding answers, is helpful and applicable to anyone’s desire to know of the truthfulness of the words of The Proclamation.